Back in the 13th century, the people of Macclesfield starting having an annual Barnaby Fair, possibly to celebrate being a Borough. The tradition continued, changing with time, but more or less died out by the end of the 20th century. In 2010 the Barnaby Fair was reborn as the Barnaby Festival. Starting as an annual weekend of art culture and fun, it's now a biannual whole week of art, culture and fun, with events scattered over the centre of Macclesfield. For some reason, Mr Monkey was completely unaware of any of this, until he got an email suggesting he should visit this year's Festival. When he saw what was on, and that the Festival logo was in orange, Mr Monkey told his humans that they were going to Macclesfield. After brunch on Sunday, Mr Monkey navigated his way along the Silk Road to a car park in Macclesfield and was soon exploring the festivities. Mr Monkey examining a decorated window. 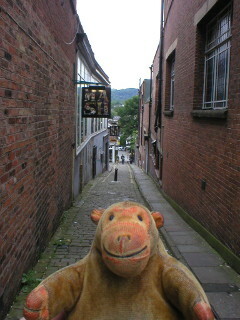 Mr Monkey looking at hills from Back Wallgate. Mr Monkey swapping a book at Backwallgate Books. Mr Monkey started off by having a bit of a wander around town. 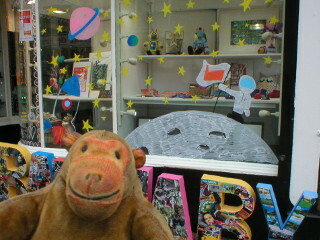 He was pleased to see that many shop windows had been decorated with a space theme to match this year's Festival theme. He spent some time following big orange footprints that led him to Hills Up Streets viewpoints. These were set up by artist in residence Ailsa Holland and each gives a view along a street towards the hills that surround Macclesfield. Some views are down ginnels with narrow, focussed views, and some along much wider streets with much more sky. Mr Monkey liked the view down Back Wallgate because it led him down to Backwallgate Books, another of Ailsa Holland's creations. 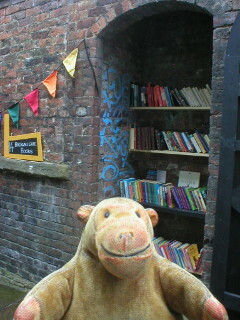 Hidden in two alcoves in a wall, this is possibly the smallest reading room and library that Mr Monkey has ever seen. He shelved a book he'd made Mr Rik carry for him, and ran off with the book of his choice. 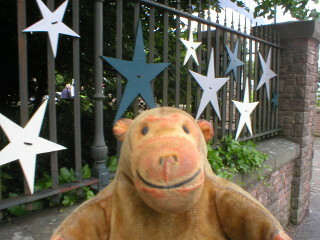 Mr Monkey looking at stars attached to railings. 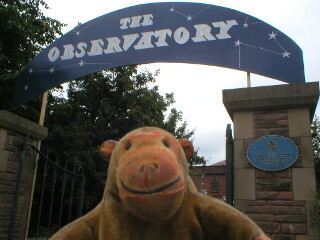 Mr Monkey at the entrance to the Observatory. Mr Monkey looking at Christ Church. Mr Monkey had booked tickets to see The Astronomer's Story at Christ Church. As he scampered through town he spotted stars tied to railings all over the place, and wondered why. There were more stars attached to the railings of Christ Church, and a large sign over the gate announcing that it was the Observatory. After pausing to admire the church, he collected his tickets and went to wait near the church in a casual manner, just in case the doors opened. Mr Monkey with his sealed orders. 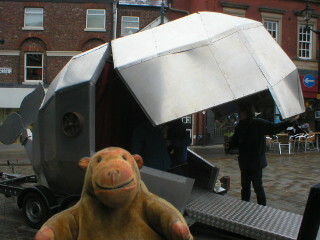 Mr Monkey witnessing The Astronomer's Story. 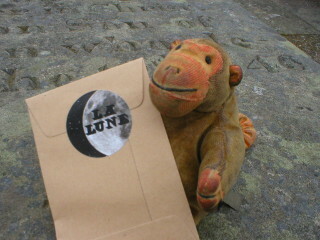 While he was waiting Mr Monkey sat on a tomb and opened a little envelope that had come with his ticket. It told him that to save Macclesfield (and the world) he had to put stars all over Macclesfield. That probably explained all the stars he'd seen around town. 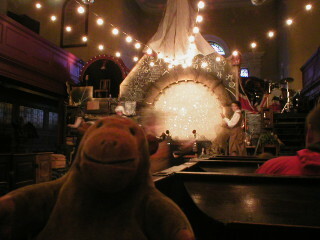 Then the doors opened and Mr Monkey was invited into the church to see The Astronomer's Story. This was a totally wonderful show, with a mixture of wit, slapstick, music and dubious science. Some time ago a series of reports in the Sun newspaper claimed that John Merschel had made a giant telescope and seen animals such as bison, bat-men and beavers on the surface of the moon, which stopped people taking him seriously. So he gathered a group of scientists to help him do something magnificent to make everyone forget about the moon beavers. After their attempts to travel to the moon fail, they hatch a plan to bring the moon down to Macclesfield. Mr Monkey was paricularly impressed by the thoughtful way in which they handed out safety goggles, which made the lights go rather funny. It was an excellent performance devised by Wild Rumpus for the site, and Mr Monkey hopes they'll do something just as exciting for the next Barnaby Festival. Mr Monkey deciding between ice cream and coffee. 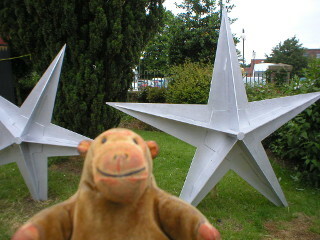 Mr Monkey examining some rather large stars. 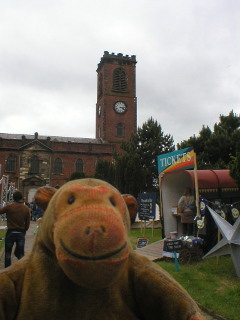 When the show had finished Mr Monkey wandered around the Christ Church Lawns. 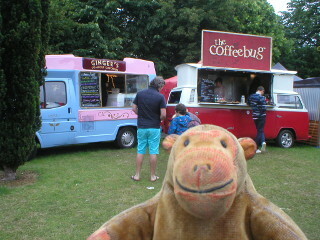 There were food stalls, including Ginger's Comfort Emporium which is Mr Monkey's favourite ice cream van ever, and there was an inflatible planetarium (with a long queue), and Mr Monkey could have had his photo taken with a Victorian camera if he could have stood still for long enough. He also found some rather large stars, but he wasn't allowed to touch them. 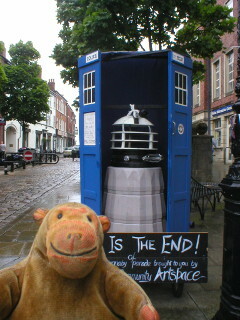 Mr Monkey with the Tardis from the parade. 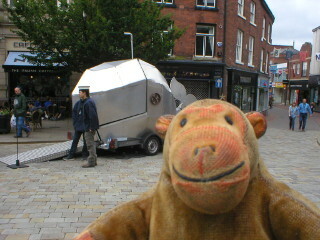 Mr Monkey looking at the whale in the Market Place. Mr Monkey scampered back to the Market Place. He popped in to St Michael's Church to see a Hidden Loss, a Macclesfield Community Artspace Textile Project inspired by Paul Nash's painting of Great War devestation, The Menin Road, and to listen to some music outside. Nearby he saw one of the floats from Saturday's Grand Parade, and wondered why Dr Who was giving lifts to Daleks. Mr Monkey stood at the end of a short queue which ended at the mouth of The Whale, and was given a pole with the estimated waiting time on it to hold. When it was his turn he went into the whale to meet a lovelorn submariner who need help to fit a song for his lover into 40 words. 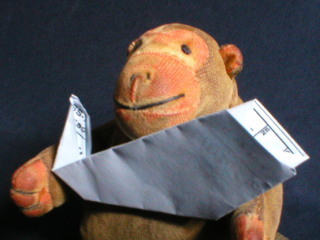 After Mr Monkey had helped, the sailor sang the message while playing a concertina, then turned the message into an origami whale for Mr Monkey to take away. This simple and charming entertainment is a Talking Birds project. Mr Monkey spotting the roving Moon. 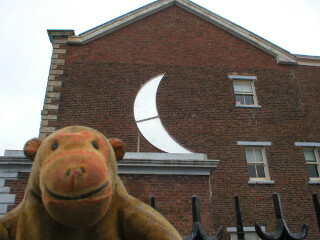 Before he left Macclesfield Mr Monkey scampered down Jordansgate and suddenly found the moon resting on the building just across a side street from the library. 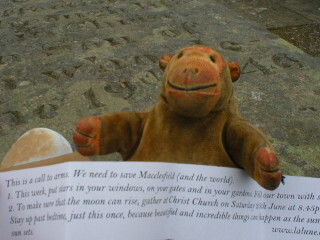 Mr Monkey knew that the moon was going to be roving around Macclesfield throughout the next week (he'd been paying attention to Mr Merschel), and that there was going to be a gathering outside Christ Church on Saturday night to put it back in the sky where it belonged. 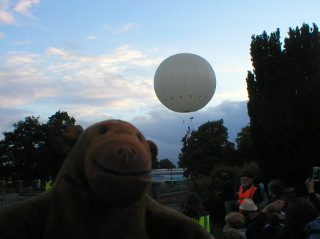 Mr Monkey decided he'd do his best to be at The Moon Rising to return the moon, even if he did have to stay up after bedtime. And he's pretty sure he'll want to go to the next Barnaby Festival. A week later, Mr Monkey pointed out to his humans that it was silly for them to not go back to to the Barnaby Festival to see The Moon Rising, what with them having seen The Astronomer's Story. He wanted to see how the people were going to get the moon back into the night sky where it belonged. They agreed with him, and on Saturday evening they all set out for Macclesfield. 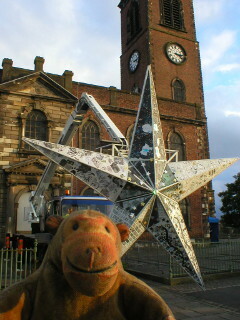 Mr Monkey looking at the Star in front of Christ Church. 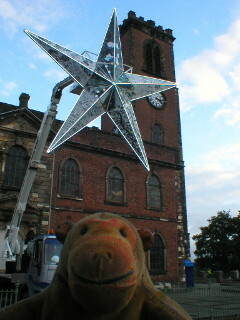 Mr Monkey watching the Star rise in front of the church. Mr Monkey watching the Moon rise. There weren't many people outside Christ Church when Mr Monkey arrived, but lots of them arrived closer to the official start time. 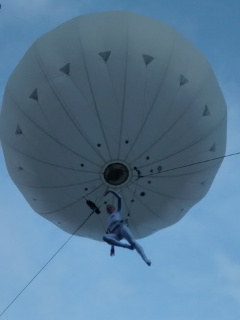 By the time astronomer John Merschel started shouting from the top of the church tower there were about a thousand people trying to work out where the shouting came from. After a short ceremony honouring the various local groups who had designed decoration of the Star, the Astronomer urged everyone to wave their home-made star and led them in a chant. The Star rose, with its edges lit up in changing colours. A moment or two after the Star stopped, the Moon rose from the carpark it had been hiding in. 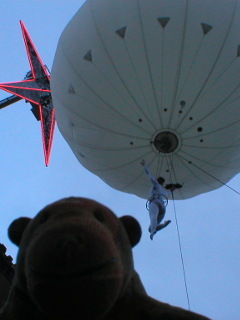 Mr Monkey watching the Moon and the acrobat pass above him. 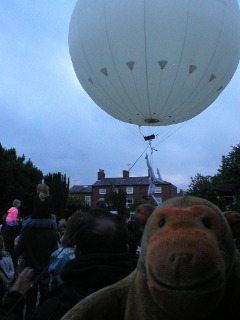 Mr Monkey watching the Moon acrobat descend to meet children in the crowd. Mr Monkey watching the Moon pass the Star on its way back. 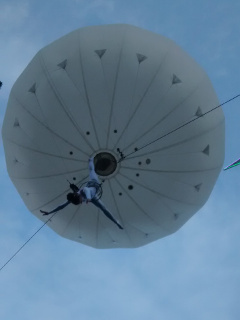 Depending on how you looked at it, either the Moon drifted or a balloon was manoeuvred past the church and onto the church lawns. Either way, it was a magnificent spectacle. 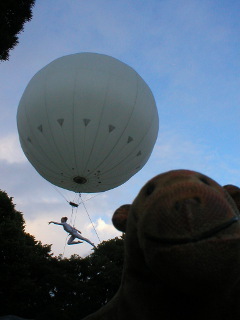 Mr Monkey was surprised to see an acrobat gyrating beneath the Moon. 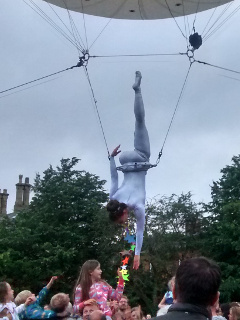 As the Moon passed over the crowd, the acrobat descended to meet children in the crowd and make the evening really memorable for them. Finally the Moon returned to its place in the night skies. Macclesfield and the world was saved, and people started drifting off home. Mr Monkey scampered back to his car, and was soon driving home after a thoroughly enjoyable evening. He's going to be very annoyed if his humans don't take him to the next Barnaby Festival. Mr Monkey displaying his really secret orders. 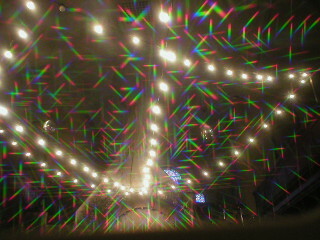 Strings of lights viewed through diffraction glasses. Mr Monkey beside the opening whale. Mr Monkey with an origami whale. 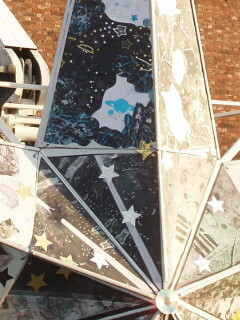 Detail of the centre of the Star. 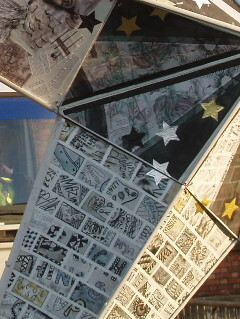 Detail of the bottom left leg of the Star. 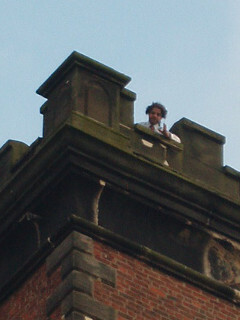 The Astronomer shouting from the tower of Christ Church. 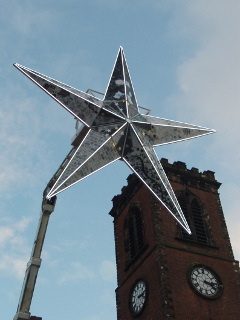 The Star rising in front of the church tower. The risen Star, illuminated in red. The moon, with the acrobat upright. The moon, with the acrobat facing downwards. 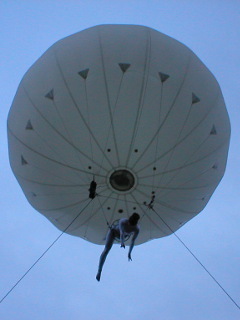 The moon acrobat reaching down to children in the crowd.